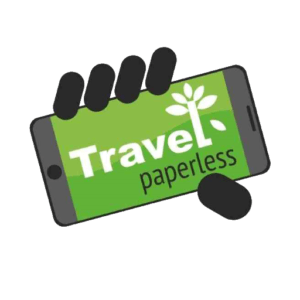 Travel paperless • Reduce waste while travelling! CONNECT TO OUR “TRAVEL PAPERLESS INITIATIVE” TODAY! Further, statistic tell us that 1.3 billion tourists traveled worldwide in the same year. Between boarding passes, hotel bookings, paper maps, guidebooks, and dictionaries tourists use it is clear we have a problem with waste in the travel industry. It is important that we think about our actions when we are traveling. We are Center of Smart Tourism — we urge tourists as well as travel industry all over the world to help free our planet from waste. Help us spread the word about paperless travel and all the ways we can help lessen our environmental footprint. There are several ways that travelers can reduce waste while traveling. Here are just a few ideas to get started. Encourage the people in your life to reduce waste of paper while traveling. Make it easy for tourists to use electronic documentation while traveling such as e-tickets and electronic reservations. Feel free to use our banner or an icon with the link to this page for helpful information to further educate your readers on paperless travel as well as smart travel tips. Blog about your experience in countries that stay environmentally friendly and share stories of unique and helpful ways to save our planet from paper waste while traveling. Travelers can generate a lot of waste of paper, even with the best intensions. There are some little things we can each do while travelling that can add up to big changes! Here at Smart Tourism Academy we educate about ways you can travel smart and paper-free. Here at Audio Guide Studio we create mobile audio guides instead of paper guides. You can order from us such for your museum or city. We appreciate any donation, big or small, to help us promote our paperless travel ideas to the people across the globe. We encourage you to share your paper-free travel experiences with us so we can use them on our social media pages. Let us know how we can help and what topic you would like to learn more about while visiting our pages. We appreciate your feedback! Everyone should know all the ways to save paper while traveling, help us educate by sharing this page with your friends and family. Share this page with friends on social networks and instant messengers so that everyone can learn to travel without paper.